Or the flat black camper/truck combination that swoops nervously in and out of the park to fill a water tank each day and get out quick before anyone talks to him. 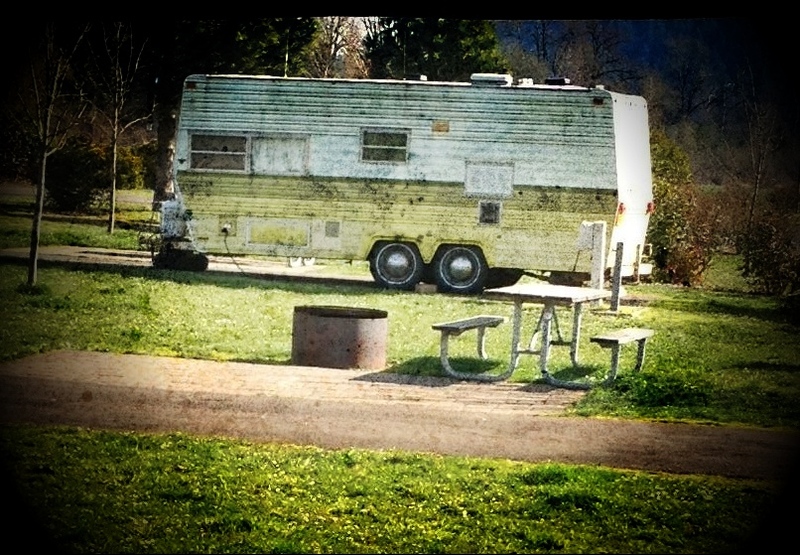 I heard him yelling when he went inside the camper…maybe he's got a prisoner chained up in there. Or maybe he was just talking loudly to himself, because he overfilled the tank. See what I mean? I can't help it. What about the couple in the huge red Peterbuilt motorhome with the American flag tacked across the grill? She, mid-60s probably, wearing a leopard print coat and white pants, black leather gloves, and large sparkly earrings…going for a bike ride? I know, I have zebra print towels… Is this my future? Then there was the campsite full of people (maybe 5 of 'em, not counting the cats) who brought a truckload of shipping pallets and kept a pallet-fed fire going almost all hours of the day and night. They'd periodically disappear into their tents for hours though, probably to sleep off the effects of the hooch they were drinking from the Nascar foam cup cozies. Were they homeless? Skipping from one state park to another after snagging a load of pallets from that place behind the truck stop? What about that one motor home with a little tiny dog door in the back that led to a little ramp out into a dog run? How nice for that dog…a yard! But then one day when we walked by, the dog run (with the ramp) was out at the campsite curb with a "For Sale" sign on it. Had the dog died? Or chewed the owner's favorite slippers? What happened? And then, the next day or so when we walked by again, the dog run was back attached, with the dog in it! Like nothing had ever happened. All these things make me very curious.